The most acclaimed ship ever made by Kenner for the Star Wars line (except maybe for the Skiff) and one of the most expensive toys collectors seek nowadays. This is a test shot and as you can see the maroon paint accents are not present. Upon close inspection you can see that the side guns are cast in black plastic instead of blue like the production version. The ship is assembled with all clear plastic parts in place. Look closer and you may be able to see that grey paint accents are not on the cockpit canopy on the painted ship. It's not very noticeable from this photo, but the two figures shown here have slightly different paint schemes on their helmets. The one on the right has a lighter brown helmet liner. Off to the very right you can see part of a Darth Vader Collectors Case that is molded in white plastic. 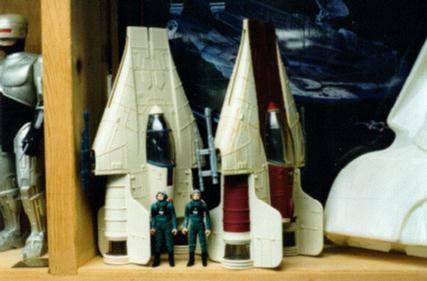 The A-Wing was issued with the Droids tv series toys.